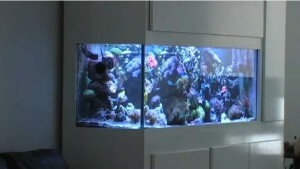 Check out this magnificent reef tank. Full of movement and color, this spectacular coral reef makes me green with envy. Take a look at the complete system and take note of the use of a refugium, protein skimmer and canister filter. Started in february 2008, 6 ft, 130g display, 70g sump, 3x MH 400W 20 000 K XM lights, 2x hydor koralia 4, ph meter, refractometer, cheato in sump+ 70 lbs live rock, fans, 1x 250 watt heater, 30g water reserve, 100 gpd RO/DI, KENT MARINE salt… Corals : tabletop Acropora sp, green montipora, orange montipora, salomon pink and orange superman monti digita, frogspawn, different anemones, kenya trees, sarcos, white pumping xenia, purple xenia, green star polyp, green hydnopora, coco worm, different riccordera, orange favia, green brain, orange brain, many kind of mushes, many kind of zoos, candy cane, devil hand, cauliflower coral, elegant coral, blue ridge, green pocillopora coral, and many more! Fishes : 12 chromis, 2 orange ocerallis, 2 onyx clowns, 1 yellow tang, 1 hyppo blue tang, 1 sailfin tang, 2 dragonnets (mandarin), 1 neon goby, many snails, conch, etc.